Ohta's Isan is Japan's popular herbal antacid remedy that has been used since 1879. This single packet packaging is great for traveling and taking on the go and has been reformulated to be sold in the USA. Use if experiencing an upset stomach due to heartburn, acid indigestion, sour stomach. Single use packet (1.3g). Take single packet orally followed with water. 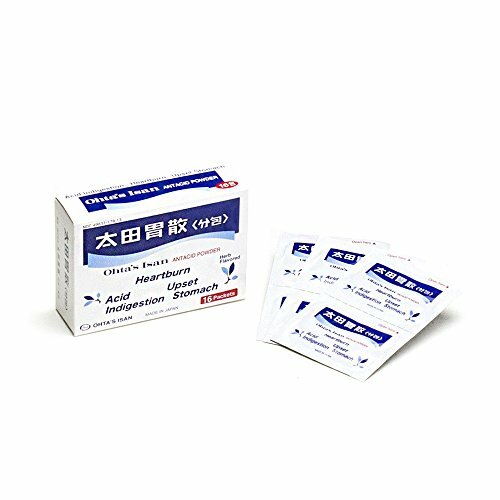 Power spread quickly in the stomach after administration and start neutralizing gastric acid. Do not take more than 3 times a day. Active Ingredients: Sodium Bicarbonate 600mg, Precipitated Calcium Carbonate 497mg. Inactive Ingredients: Cinnamon Bark, Fennel, Nutmeg, Clove, Citrus Unshiu Peel, Gentianm Powdered Picrasma Wood, l-Menthol, Magnesium Carbonate. If you have any questions about this product by Ohta's Isan, contact us by completing and submitting the form below. If you are looking for a specif part number, please include it with your message.